Web.com—How Do I Review and Reply to a Support Ticket? Once you submit a support ticket, our team may have questions on further clarification or information. 4. Next to the ticket, click See Details. 5. Click the Add Comment button. 5. Click the Add Attachments icon to add an image or additional file. You have reviewed and replied to a ticket that needed more information. Web.com—How Do I Create and Submit a Support Ticket? 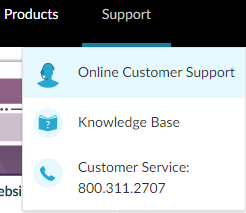 Web.com—How Do I View My Current List of Support Tickets?